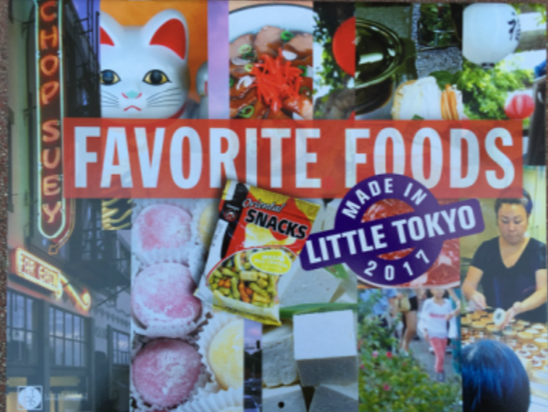 “Favorite Foods: Made in Little Tokyo,” the Little Tokyo Historical Society’s (LTHS) 2017 calendar, is now available throughout Little Tokyo. Photographs of yesteryear and contemporary foods and restaurants include the first sushi bar (Kawafuku), Umeya rice crackers, California roll (Tokyo Kaikan), fortune cookie (Fugetsudo), fusion food (JiST Cafe), and Imagawayaki (Mitsuru Cafe). Included in each calendar is a one-page insert of coupons for Curry House, Far Bar, JiST Cafe, and Mitsuru Cafe. Calendars are available at Bunkado, Japanese American National Museum store, Kinokuniya Bookstore, and Rafu Bussan. Online orders can be made at www.littletokyohs.org. It’s not too early to think about this unique and fun historical record as part of your holiday gift list. LTHS is observing its 10th anniversary this year and continues to focus on researching and discovering the historical resources, stories and connections of sites, buildings, and events related to Little Tokyo as an ethnic heritage neighborhood of Los Angeles. LTHS is committed to documenting, preserving and sharing the history and personal stories of Little Tokyo and its residents.